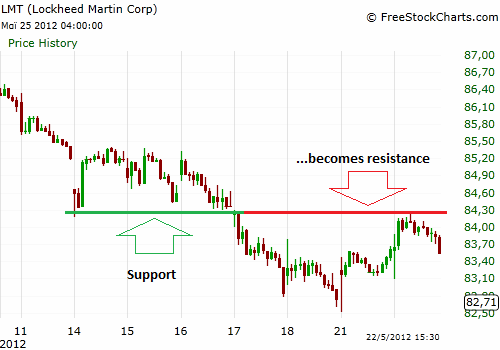 Support and resistance have a very important property. 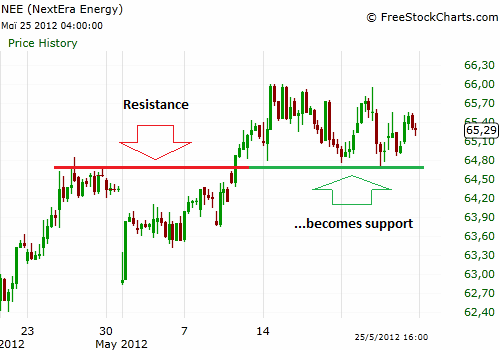 When support breaks downwards it becomes resistance and when resistance breaks upwards it becomes support. The transformation of support into resistance and vice versa seems almost metaphysical, but in reality there are certain psychological rules that make this property real. 1. Traders who believed the stock would go up, bought it and then trapped. They are loosing money every day and they desperately want the stock to come back where they bought in order to sell and correct their mistake (be break even). 2. Short sellers who shorted the stock and made profits. When the stock revisits the ex support level they will sell short again due to the gratification they felt (profits) the first time. 3. Traders who were thinking of shorting the stock when it was at support but they didn’t. They blame themselves for not doing the right move, so when price revisits ex support they think that now is the time to short sell and take the profit they couldn’t take before. 4. 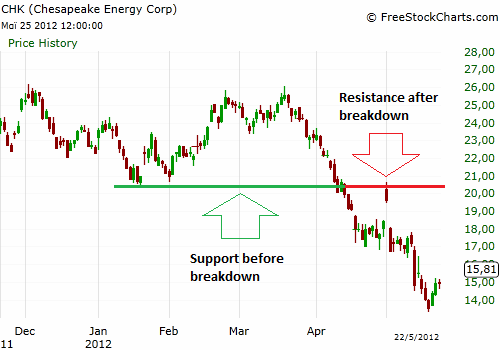 Technical analysts who know about the transformation of support into resistance and sell short to make profit. 1.Traders who believed the stock would go down, shorted it and then trapped. They are loosing money every day and they desperately want the stock to come back where they shorted it in order to buy, close the position and correct their mistake (be break even). 2. Buyers who bought the stock and made profits. When the stock revisits the ex resistance level they will buy again due to the gratification they felt (profits) the first time. 3. Traders who were thinking of buying the stock when it was at resistance but they didn’t. They blame themselves for not doing the right move, so when price revisits ex resistance they think that now is the time to buy and take the profit they couldn’t take before. 4. 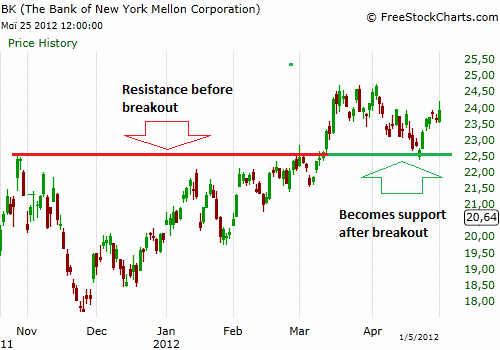 Technical analysts who know about the transformation of resistance into support and buy to make profit.